"... My first pre-workout drink without caffeine in it and you know what, I like it. You still get a ton of energy, great pumps and endurance. I can squeeze out a few more reps as the lactic acid takes a bit longer to build up which is pretty unique to any product I've used. Fruit punch is their only flavor but it's good so that's ok. b+"
"... I decided to give this a try as I found it on sale. Glad I did. I was never a big fan of pre-workout / stim type products because they always made me crash and made me shake. Complx5 however gives me the drive I need and pick-me-up focus without the nonsense side-effects. Really has improved my workouts and I will continue to use it." It's time to experience the best workouts of your life for some serious progress! 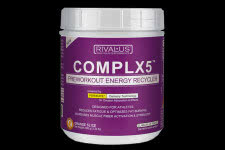 Rivalus is the leader in athlete driven supplements, such is the case with their Complx5 pre workout energizer! One of the great and unique things about this drink mix is that it gets to work very quick, fueling your body with an increase in strength, and recovery unlike anything else. A key factor that sets Complx5 apart from the rest is that it also slows down the time that fatigue kicks in, this means you can train longer and harder than the rest. A bonus with Complx5 is that you can expect a fat burning benefit, pretty great right? A powerful combination of five core components that are micronized for fast absorption and superior results. 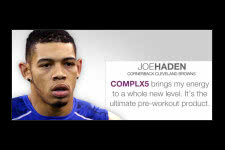 Take your exercise performance beyond any level the rest of the brands hype up in the magazine, with Complx5 you are getting products tested by and used by athletes. Be sure to stop by and share YOUR experience with us at fitFLEX! Erase Fatigue and Maximize Explosive Strength! Specifically Designed and Tested for Advanced Athletes!